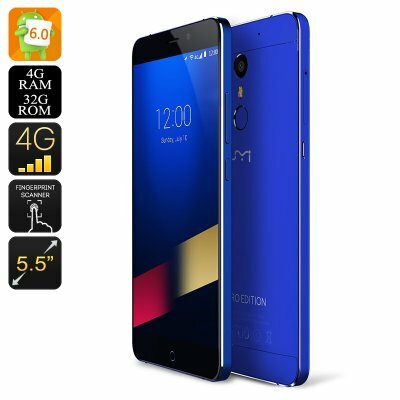 Successfully Added UMI Super Smartphone Limited Edition - Android 6.0, 64BIT Octa Core CPU, 4G, 256GB SD Slot, Quick Charge (Blue) to your Shopping Cart. Inspired by the recent Euro cup, UMI came up with a limited edition of its popular Smartphone the UMI Super in a fitting European blue color that looks absolutely stunning. Celebrate your love for Europe’s favorite game with this staggering Smartphone that, with its royal blue color, is guaranteed to turn heads wherever you go. This phone will only be available for a limited time, however, so you have to act fast if you want to get it. The UMI Super is filled with advanced features that all Android lovers are looking for in a flagship Smartphone. The device itself is merely 7.6mm thin and has been equipped with 4GB of RAM, a Heilo P10 Octa-Core CPU, stunning Mali GPU, 32GB of internal memory and has a whopping 4000mAh battery that provides excellent durability. It also comes with an Android 6.0 Operating System, a fingerprint scanner, quick charging ability, and much more. Its 5.5 Inch HD display offers the latest SHARP display technology, allowing you to enjoy all your movies, photo’s, games, and apps in breathtaking quality. This next generation of display offers a higher color-saturation, gull HD resolutions, and is furthermore designed for use in broad daylight meaning that from now on you can enjoy all your media files even in bright sunlight. The Smartphone has also been equipped with a powerful 13MP camera that is capable of taking high digital pictures. With this camera at your disposal you are guaranteed that not a single special moment in life stays un-captured. With its Android 6.0 operating system the UMI Super truly is a Smartphone that is capable of dealing with all the heavy lifting of multi-tasking. Its sleek design with a metallic aluminum body and curved edges has minimal bezels and the Smartphone’s dazzling polished finish gives it a professional look. The UMI super Smartphone truly is a powerful multifunctional device that is the perfect choice for private and corporate use alike. The UMI Super Smartphone comes with a 12 months warranty, brought to you by the leader in electronic devices as well as wholesale Android cell phones..